Hibiscus flower in my front yard in Hudson, Florida. Shot with my SX-70 Alpha I SE on 600 film. Picturecrossing No. 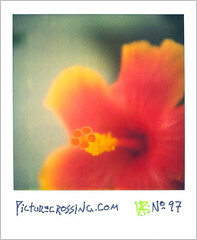 97 (SX No.37) - Shot on 7/5/08. 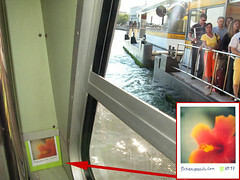 LEFT: on 7/19/09 on a Vaporetto in Venice, Italy between the San Marco and San Zaccaria stops. i am glad its there too. PX No.270 "Elmer Fudd <3s Pikachu"